Ireand continued to knock up the records after a thoroughly spell-binding victory over a shell-shocked Italian side at Lansdowne Road. They ran in six tries to chalk up their biggest championship victory with young fly-half Ronan O'Gara contributing a record 30 points with a flawless kicking performance. Italy were just swept aside as Ireland opened up yawning gaps with their pace over the ground and the speed of the balll through their hands. The game was already settled at half-time with Ireland turning around 33-0 ahead. Once again, errors were at a premium for the Irish, while they hammered any indiscretion from the leg-weary visitors. Certainly Derek Bevan refereeing his last international game, was kept extremely busy keeping up with play such was the verocity displayed by Ireland. The Irish had been under tremendous pressure going into the Scotland game a fortnight ago. But following that emphatic victory and expecting to coast past the Six Nations newcomers, they came under a different mental strain. But the worries were soon eased by O'Gara who stroked over a simple penalty in the third minute. Then the Lansdowne Road crowd got what they wanted. Starved of something to shout about they were soon appreciating an Ireland performance that will live long in the memory. In the eighth minute after a piece of sublime skill by scrum-half Peter Stringer, the first of Ireland tries emerged. The Munster scrum-half took the ball from a line-out and ran a couple paces across the field before flicking a pass around his back to his speeding skipper Keith Wood who had surged from the touchline. Wood broke the initial cover with his power before sprinting in at the posts. 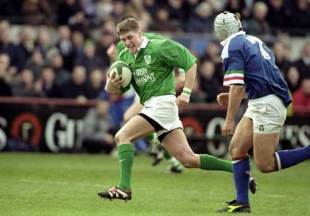 O'Gara converted and then put Ireland 13-0 ahead with his second penalty in the 13th minute. It got even better before the end of the first quarter. The forwards, with Kieron Dawson and Simon Easterby drove upfield, and Stringer fed the upwardly mobile Peter Clohessy from recycled ball and quick hands did the rest. The burly prop put Mike Mullins into the gap to make ground. The Auckland-born centre then fed O'Driscoll who cleverly drew the defence out wide before feeding an inside pass to the supporting Shane Horgan to crash over for his second international try. O'Gara once again followed up the conversion with a straight-forward penalty in the 25th minute as Ireland began to grow in stature. Italy were a little non-plussed by the urgency and physical nature of Ireland's play and it was no wonder they failed to get into their stride. Even the normally dead-eye boot of Italian maestro Diego Dominguez was strangely off-key as he pushed an easy penalty wide. And their problems were made worse in the 36th minute with Ireland's third try. The pack, who had an insatiable appetite for loose ball, allowed Stringer to fire out one of his bazooka passes to O'Gara. The fly-half drew the defence with him out wide and he presented Dawson with his first international try with a left inside pass to leave the flanker with a clear run to the posts. With O'Gara banging over the conversion and adding his third penalty, at 33-0 at the break, Ireland were already out of sight and over the horizon of fear. They started to come down the other side of the hill soon after the restart with O'Gara's fifth penalty before Dominquez knocked over a penalty. O'Gara again kept up his 100 per cent record with another penalty in the 56th minute before the brilliant skills of Brian O'Driscoll zoomed in under the posts. Italy did put Ireland some pressure midway through the half with number 8 Andrea de Rossi crashing over with Dominguez converting. But Ireland finished with a flurry. First Girvan Dempsey picked up a loose-ball to scythe his way through to the posts and in the final move of the game, Horgan grabbed his second try with burst along the left wing.